The iconic road trip is a rite of passage for many. However, one day of junk food and forced sitting in the tight confines of a car may be all you can stomach. If you’ll be hitting the road this season, keep the following tips in mind to stay healthy and maintain a sunny disposition along the journey. Move at pit stops: When you stop at rest stops or roadside attractions, take a few extra minutes to stretch your muscles. Looks for parks or playgrounds where the children’s playground equipment can double as gym equipment. As an alternative, look for the brown roadside signs that indicate state parks or nature preserves. Most include walking trails. Even historical markers by the road will have a short distance to walk to read placards or to see historic sites. All get the body moving. Do you have kids with you? Five minutes of tag or a quick running race to the slide and back will be enough to feel healthier and less tense when you reenter your car. Stretch at the wheel: Even while driving, you can undertake a few simple moves. Changes to your body posture can alleviate muscle and spine stress. While sitting, squeeze glutes and release them slowly, tighten abs and relax to the beat of the music on your radio, and try slow neck rolls when safe to do so. 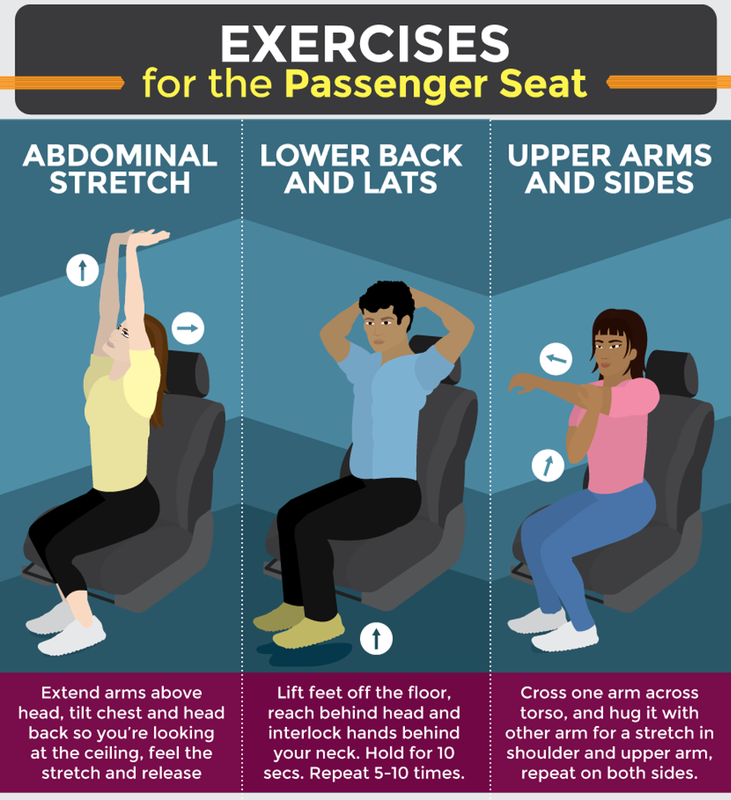 Stretches in the passenger seat: When you’re the passenger rather than the driver, it’s even easier to get your body moving. Try abdominal stretches, extending your torso as you sit and raising your feet off the floor. This naturally elongates your spine and improves your posture. Even if your hotel lacks a gym (or anything resembling a gym), you can still get a workout in your room. Try a 15-minute yoga practice or get a toning and cardio workout without any equipment via a bodyweight program. Need to get outdoors? Ask the front desk personnel for directions to a nearby jogging or bike trail. Easy items to bring from home to improve any hotel room workout include: a yoga mat, resistance bands, running shoes. Read more about, “Staying Healthy on a Road Trip” from our friends at FIX.com here.